Pineapple Fried Rice – Elly Says Opa! I mentioned earlier that we’ve been eating too much white rice lately, in part because brown rice takes too long to cook for us during a weekday. But fried brown rice is easy to achieve during the week, because you can just cook the rice the night before, since cold rice is ideal. Then, making the actual dish is really fast. This particular fried rice has a little island-y feel to it thanks to the pineapple. It’s nice and colorful from the peppers and it just tastes great. You really can never go wrong with ginger and garlic, right? The soy sauce adds a nice salty balance to the sweet pineapple and you get a little deep, toasty flavor from the sesame seed oil. This was a hit with everyone (even Ian, who enjoyed his portion soy sauce-less :)). Heat a large wok or skillet over medium-high heat and add the oil. When shimmery, add the onions, garlic, ginger, and white parts of the green onions. Cook for about 3 minutes, until golden. Stir in the pepper and cook until it begins to soften. 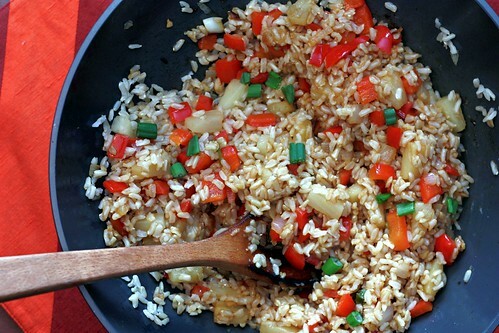 Add the rice and pineapple, mixing with a wooden spoon to break up any clumps of rice. Stir fry until lightly browned, 3-5 minutes, stirring constantly, adding the soy sauce in during the last minute. Drizzle with the sesame seed oil and garnish with the green onion parts.